There is Panasonic GH4 news from two of my favorite online retailers, Adorama and B&H. First, Adorama. There's not a lot of discounting on the GH4's $1699.99 list price yet, but the best price out there right now (at least in the US) is this $1697.99 deal at Adorama - it's only a penny off the $1698 price at Amazon - but it includes the usual entry level "kit" of a camera holster, SD card, cleaning kit and screen protector. Of course, they're backordered right now, but you might as well get some free stuff with your camera when it comes in. When you do get your hands on your camera, you'll probably want some tips from the experts on how to use it. Over at B&H, they're ofering a free Panasonic GH4 Live Webcast Discussion: "Professional 4K in the Palm of Your Hand" on May 27th from 1 to 3PM Eastern (registration required). Speakers (and GH4 experts), David Flores, Eduardo Angel and Mathew Frazer will participate in a panel discussion on the camera and answer your questions. This is another great service to the community from B&H, in addition to their excellent educational resources, great prices and customer service. I really like them (and they're not even a sponsor, so I'm not paid to say that :)). 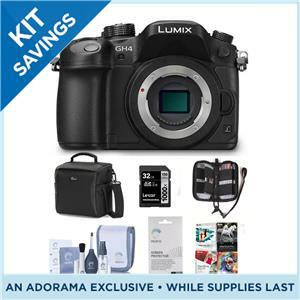 Speaking of sponsors, if anything here has helped you to make a decision to buy a GH4, please click on one of the links or display ads on the site. It won't cost you anything and it will help to keep news about great camera deals coming. This site would not exist if it weren't for your support. Thank you.